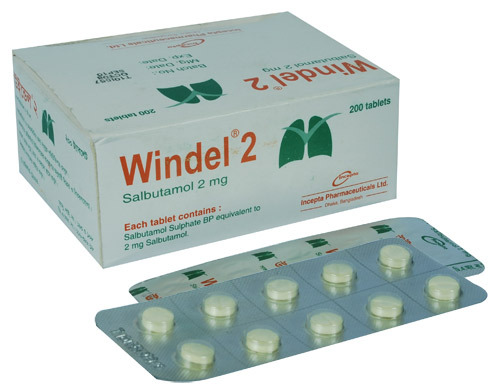 Windel 2 tablet: Each tablet contains Salbutamol Sulphate BP equivalent to 2 mg Salbutamol. 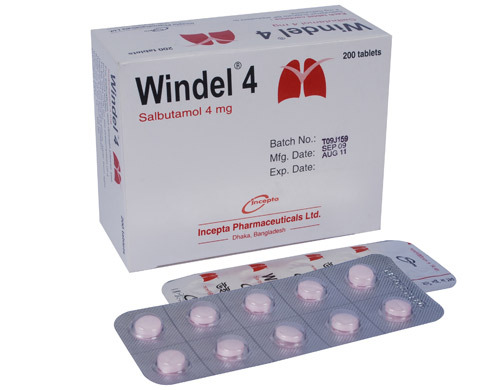 Windel 4 tablet: Each tablet contains Salbutamol Sulphate BP equivalent to 4 mg Salbutamol. 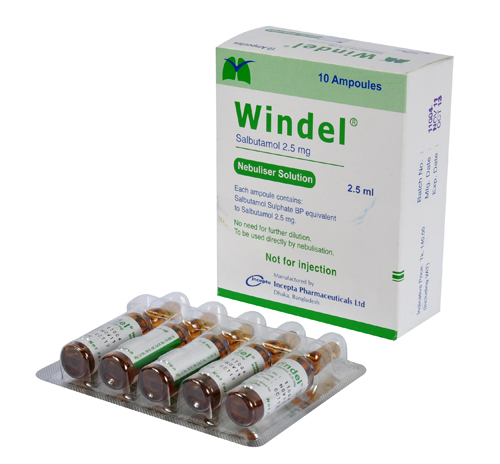 Windel nebuliser solution: Each ampoule conbtains 2.5 ml isotonic, clear solution for inhalation of Salbutamol Sulphate BP equivalent to Salbutamol 2.5 mg.
Windel syrup: Each 5 ml contains Salbutamol Sulphate BP equivalent to 2 mg Salbutamol. 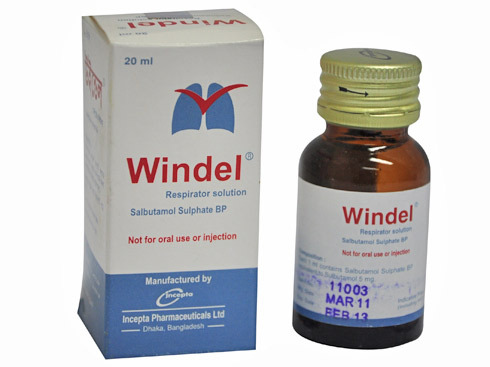 Windel Respirator Solution : Each 1 ml solution contains Salbutamol Sulphate BP equivalent to Sulbutamol 5 mg.
Salbutamol is a synthetic sympathomimetic agent with predominant beta-2 adrenergic activity. Salbutamol produces bronchodilatation through stimulation of beta-2-adrenergic receptors in bronchial smooth muscles, thereby causing relaxation of bronchial muscle fibres. This action is manifested by an improvement in pulmonary function as demonstrated by spirometric measurements. Asthma, Chronic Bronchitis, Emphysema and other conditions associated with airways obstruction. 2-4 mg tablet, 3-4 times daily. Maximum single dose is 8 mg tablet. To be used with a suitable nebuliser device under the direction of a physician. The solution must not be injected or ingested. Adults (and the elderly): 0.5 ml - 1.0 ml salbutamol up to four times a day. 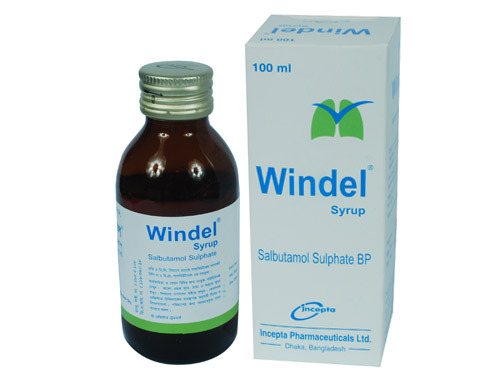 Up to 40mg per day can be given under strict medical direction in hospital. 0.5 - 1ml solution should be diluted to final volume of 2 - 4 ml with sterile normal saline solution. It will take time about 10 minutes. Salbutmol respiratory solution may be used undiluted for intermittent administration. For this 2.0 ml of the solution is placed in the nebuliser and the patient allowed to inhale until bronchodilation is achieved. This usually takes 3-5 minutes. Children under 12 years of age: 0.5 ml of the solution diluted to 2.0 - 4.0 ml with normal saline. Some children may however require higher doses of up to 1.0 ml of the solution. Intermittent treatment may be repeated four times a day. 1 - 2 ml solution is diluted to made up to 100 ml with normal saline solution. The diluted solution is administered by a suitable nebuliser devise. When there is risk of anoxia through hypoventilation, oxygen should be added to the inspired air. Adults & Elderly: 2.5 mg to 5 mg Salbutamol up to 4 times a day. Up to 40 mg/day may be given under strict medical direction in hospital. Children under 12 years: 2.5 mg up to 4 times a day. Higher dose up to 5 mg four times a day may be used if required. Salbutamol should be used with caution in patients with hyperthyroidism, cardiovascular disease, occlusive vascular disorders, hypertension and aneurysms. Hypokalaemia associated with high doses of Salbutamol may result in increased susceptibility to digitalis-induced cardiac arrhythmia. Tachyphylaxis with resistance may occur with prolonged use of high dosage. Care is necessary when treating patients with diabetes mellitus or closed-angle glaucoma, and in those receiving antihypertensive therapy.